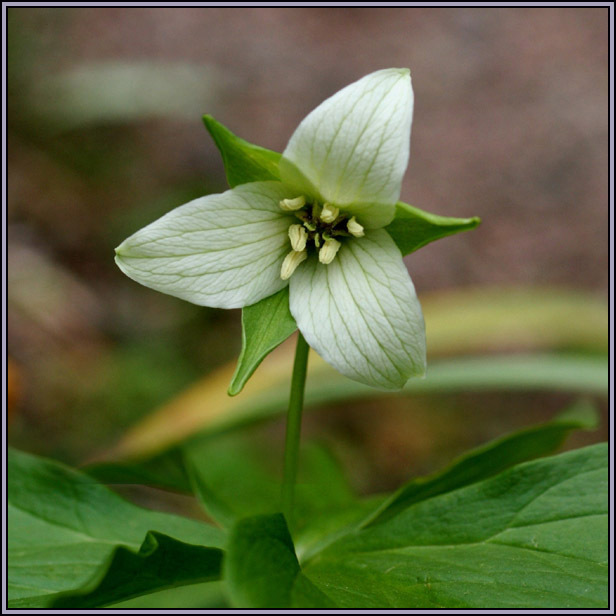 Accurately naming Trilliums can be a bit of a frustrating business. Even the best of experts beg to differ on occasion. Nevertheless, when treating the genus broadly, we can at least separate the sessile species from the pedicellate species. For instance, the well known Trillium chloropetalum belongs to the sessile group, all of which lack a pedicel or stem between the flower and the leaf bracts, and most of them can also be distinguished by their beautiful mottled leaves. Meanwhile the pedicellate species can be seen to possess such a stem which often allows their flowers to nod. They can be generally found in the swamps and forests of the South Eastern States of America. Nevertheless, they are quite at home in the light shade of an Irish garden. But if anyone is duly inspired to grow these plants from seed then a word of warning is required. Extreme patience is something of a necessity. Germination of seed may take place only after a number of years. 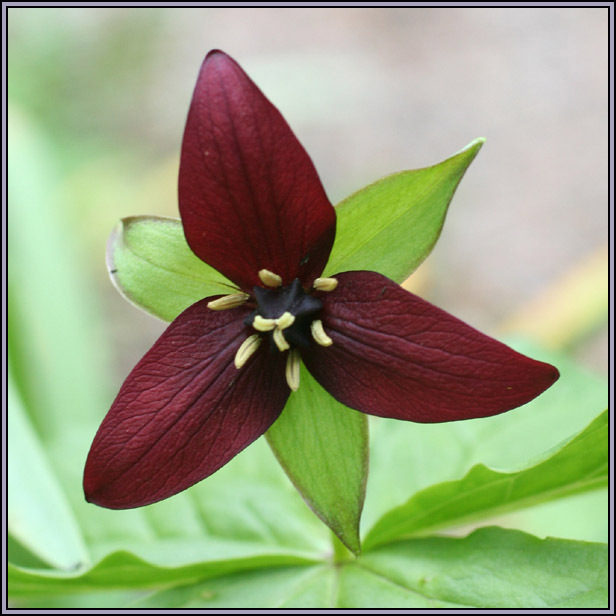 and thereafter it may be five or six years before a flower is obtained, and this is why some Trilliums can appear so expensive in nursery catalogues. However it remains an inexpensive way of obtaining a good number of plants to play with. But don't throw away those weedy old pots ! Commonly known as Birthroot in its native home. It is extremely variable in both stature and flower colour. They may be deep red or white or any shade in between. 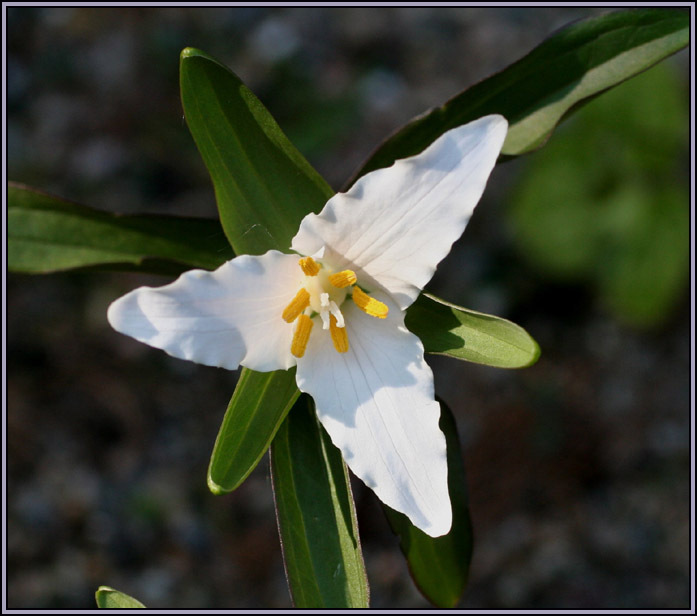 It is a member of a confusing group of species or sub- species which is often referred to as the Trillium erectum Complex. Gardeners who believe they are growing this species may be innocently growing T.erectum (... and I'm aware that this may apply to me !) It hails from the mountains and forest margins of Tennessee, Georgia, and the Carolinas. It is said that one of the best ways to tell the difference between T. simile and T.erectum is to smell the plant T.simile is locally known as Sweet White William and the clue to its odour is in this name. In contrast, T.erectum is said to smell of 'wet dog' I'm happy to say that my plant doesn't even smell of a small wet doggie ! This is currently my favourite species. It is a notably dwarf plant,attaining a height of approximately 12 to 14 cm, and it quietly creeps around by means of slender rhizomes The flowers are white or occasionally pink and they are extremely beautiful. It is an ideal species for growing in a trough. 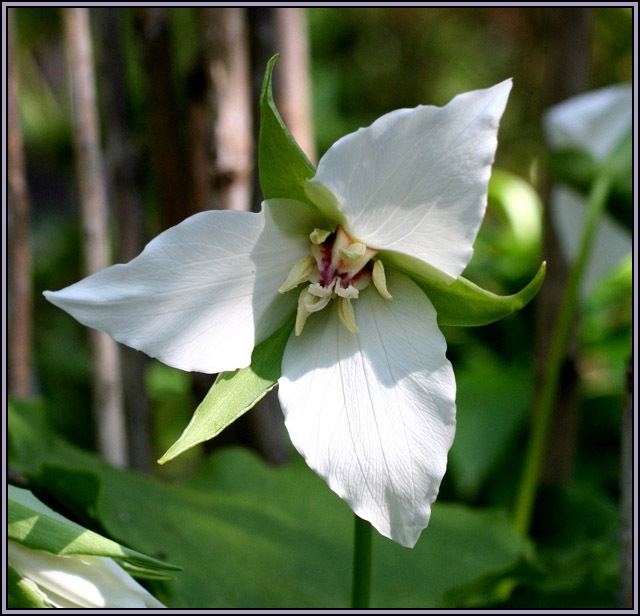 If anyone wants to become better acquainted with the genus Trillium then it might be worthwhile checking out the relevant Flickr albums of Alan Cressler and Jim Fowler where you will find some stunning images of Trilliums in habitat ... enjoy!